Led by researchers at the University of California, San Diego School of Medicine, scientists have, for the first time, created stem cell-derived, in vitro models of sporadic and hereditary Alzheimer's disease (AD), using induced pluripotent stem cells from patients with the much-dreaded neurodegenerative disorder. "Creating highly purified and functional human Alzheimer's neurons in a dish – this has never been done before," said senior study author Lawrence Goldstein, PhD, professor in the Department of Cellular and Molecular Medicine, Howard Hughes Medical Institute Investigator and director of the UC San Diego Stem Cell Program. "It's a first step. These aren't perfect models. They're proof of concept. But now we know how to make them. It requires extraordinary care and diligence, really rigorous quality controls to induce consistent behavior, but we can do it." "We're dealing with the human brain. You can't just do a biopsy on living patients," said Goldstein. "Instead, researchers have had to work around, mimicking some aspects of the disease in non-neuronal human cells or using limited animal models. Neither approach is really satisfactory." The iPSC-derived neurons from the Alzheimer's patients exhibited normal electrophysiological activity, formed functional synaptic contacts and, critically, displayed tell-tale indicators of AD. Specifically, they possessed higher-than-normal levels of proteins associated with the disorder. With the in vitro Alzheimer's neurons, scientists can more deeply investigate how AD begins and chart the biochemical processes that eventually destroy brain cells associated with elemental cognitive functions like memory. Currently, AD research depends heavily upon studies of post-mortem tissues, long after the damage has been done. "The differences between a healthy neuron and an Alzheimer's neuron are subtle," said Goldstein. "It basically comes down to low-level mischief accumulating over a very long time, with catastrophic results." The researchers have already produced some surprising findings. "In this work, we show that one of the early changes in Alzheimer's neurons thought to be an initiating event in the course of the disease turns out not to be that significant," Goldstein said, adding that they discovered a different early event plays a bigger role. Though just a beginning, Goldstein emphasized the iPSC-derived Alzheimer's neurons present a huge opportunity in a desperate fight. "At the end of the day, we need to use cells like these to better understand Alzheimer's and find drugs to treat it. We need to do everything we can because the cost of this disease is just too heavy and horrible to contemplate. Without solutions, it will bankrupt us – emotionally and financially." "Axons and dendrites are the basis of neuron-to-neuron communication, and when they are lost, neuron function is lost," said UTMB professor Ping Wu, lead author of a paper on the research appearing in the Journal of Neurotrauma. "In this study, we found that our stem cell transplantation both prevents further axonal injury and promotes axonal regrowth, through a number of previously unknown molecular mechanisms." The UTMB researchers began their investigation with a clue from their previous work: they had determined that their neural stem cells secreted a substance called glial derived neurotropic factor, which seemed to help injured rat brains recover from injury. 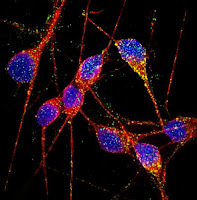 As a first step toward identifying the processes by which GDNF and neural stem cell transplantation produced their beneficial effects, Wu enlisted UTMB professors Larry Denner, Douglas Dewitt and Dr. Donald Prough to use proteomic techniques to compare injured rat brains with injured rat brains into which neural stem cells had been transplanted. "We identified about 400 proteins that respond differently after injury and after grafting with neural stem cells," Wu said. "When we grouped them using a state-of-the-art Internet database, we found that a group of cytoskeleton proteins was being changed, and in particular one called alpha-smooth muscle actin, which had never been reported in the neurons before." Because so many of the proteins that changed were related to axonal structure and function, the UTMB scientists then focused on traumatic axonal injury. Initially working with rats, they confirmed that axons and dendrites suffered damage from trauma; implanted neural stem cells reduced this harm, as well as lowering levels of alpha-smooth muscle actin inside neurons that were raised after trauma. To probe further into the molecular details of GDNF's role in reducing traumatic axonal injury, the researchers used a system in which human neurons were placed on a flexible membrane that was then suddenly distended with a precisely calibrated puff of gas. Their goal was to simulate the sudden compression and stretching forces exerted on brain cells by a blow to the head. Initial results from this "rapid stretch injury model" matched those seen in rat experiments, with GDNF protecting axons and dendrites from additional damage in the period after trauma and significantly reducing alpha-smooth muscle actin levels boosted by the simulated injury. In addition, they found evidence linking alpha-smooth muscle actin with RhoA, a small protein that blocks axonal growth after injury. Finally, again taking a cue from their proteomic study, they turned their attention to one component of a protein known as calcineurin, finding that it interacted with GDNF to protect axons and dendrites in the RSI model. "We're quite excited about these discoveries, because they're highly novel — we now know much more about how GDNF protects axons and dendrites from further injury and promotes their re-growth after trauma," Wu said. "This kind of detailed study is essential to developing safe and effective therapies for traumatic brain injury." Newly published research by scientists at Oregon Health & Science University provides significant new information about how early embryonic stem cells develop and take part in formation of the primate species. The research, which took place at OHSU's Oregon National Primate Research Center, has also resulted in the first successful birth of chimeric monkeys — monkeys developed from stem cells taken from two separate embryos. The research will be published this week in the online edition of the journal Cell and will be published in a future printed copy of the journal. Here's more information about the early primate stem cells that were studied: The first cell type was totipotent cells — cells from the early embryo that have the ability to divide and produce all of the differentiated cells in the placenta and the body of organism. These were compared with pluripotent cells — cells derived from the later stage embryo that have only the ability to become the body but not placenta. "This is an important development — not because anyone would develop human chimeras — but because it points out a key distinction between species and between different kind of stem cells that will impact our understanding of stem cells and their future potential in regenerative medicine," explained Shoukhrat Mitalipov, Ph.D., an associate scientist in the Division of Reproductive and Developmental Sciences at ONPRC.